Choosing the right paint colors for the interior wall of your home can be a challenge for clients. 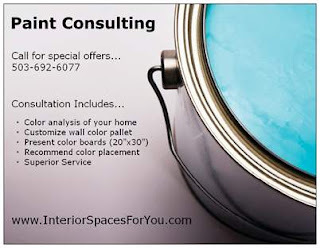 Anita with Interior Spaces has years of experience and daily works on a variety of color consultations with clients. Years of experience and good eye for color have helped develop Anita’s keen sense of connection with each client. Personal, professional, experienced and affordable are words that best describe her service in the Portland Metro Area including Vancouver, West Linn, Wilsonville, Sherwood, and Beaverton in the beautiful state of Oregon. Where do you start in choosing wall colors for your home? Another tip that I like to tell clients is look at the paint color in all lights. How color appears in the sunny south side of the home will be different that on the shade or north side of the home. Color changes as light changes, so view them in the morning, mid day and at night when only incandescent lighting is used. One of the services I offer clients is to keep the 20” x 30” sample boards that I create for their master plan of color and move them around all times of day to make sure they will like the color at all times.